Today I want to write about a very strange looking primate, the Yunnan snub-nosed monkey. Also known as the black snub-nosed monkey, these beautiful looking animals grow up to 83 cm long, with a tail that is up to 75 cm long. They have a very strange diet, mainly eating lichen that grows on tree trunks, which isn’t very nutritious. Lichen takes a long time to grow, so these guys travel a lot in search of food. Their weird noses don’t have any bones and their nostrils are turned upwards. They have long shaggy fur to protect them from freezing winters. When the babies are born, they are completely white and they get darker with age. 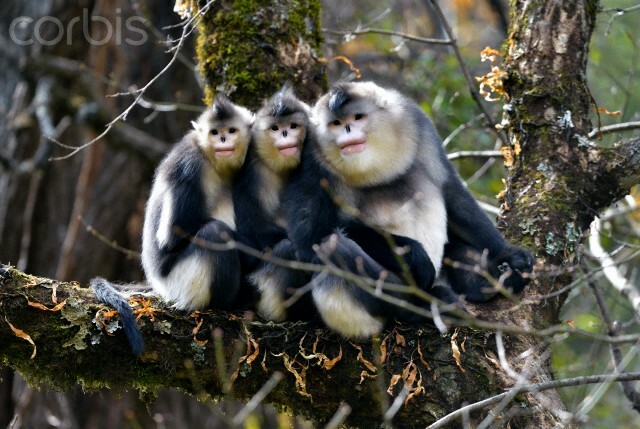 Yunnan snub-nosed monkeys live in high altitude forests in south western China. They are found in higher altitudes than any other primate and are endangered. There are only about 2,000 of them left in the wild due to habitat loss and hunting. Are there any other interesting facts that you would like to share about Yunnan snub-nosed monkeys?